ERM Gap Assessment - Process Partners can quickly conduct a gap assessment of a company's ERM processes and controls to identify opportunities for improving the effectiveness of their ERM capabilities. Risk Assessment - Process Partners has a proven approach and extensive experience in facilitating executive and cross functional management / employee teams in the identification of goals and strategies and the risks that may hinder their achievement. Risk Management Process Optimization - Process Partners' core competencies include process and internal control optimization. We have a defined and documented methodology for establishing sustainable new business processes with a high level of ownership across both levels and functions of an organization. 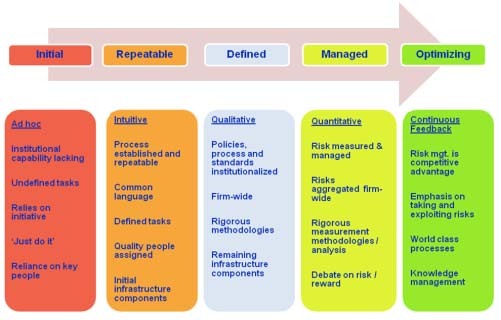 Process Partners applies the above ERM Maturity Model as the framework for assessing the current state of an organization's risk management state and for facilitating the understanding of the changes required for improvement.